How do you settle its parts when the whole is in upheaval? 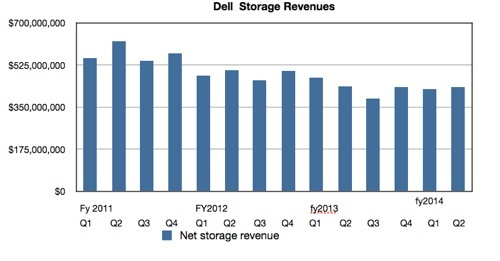 Dell's storage revenues are continuing to decline as the company fails to reap the benefits of its acquisitions. EqualLogic and Compellent were great startups but the stellar growth of those two units has not translated into stellar growth for Dell's storage revenues. In its latest quarter, which finished at the end of June, the tech giant's results included storage revenues of $432m, which were slightly down on the same quarter a year ago, which saw $464m. They were higher than the Q1 2013 figure of $424m. Michael Dell's company is doing better with its servers and networking products than it is with storage. We don't know why but it might be that Dell has no monolithic storage offering like IBM's DS8000, HDS' VSP, EMC's VMAX or HP's OEM'd Hitachi VSP, to bulk up its storage revenues. Neither does it have a native filer, relying on NAS heads on its block arrays. Compellingly logical or equally compelling?